Sexual Avengers is a network of queer campaigns and individuals making 2017 a year of radical queer activism and community building. Walking around London, you’ve likely noticed circular blue plaques next to doorways, in front of alleyways or on corner stones of buildings. These plaques are there to educate passersby of England’s rich history—its mostly white, heterosexual, male history that is. 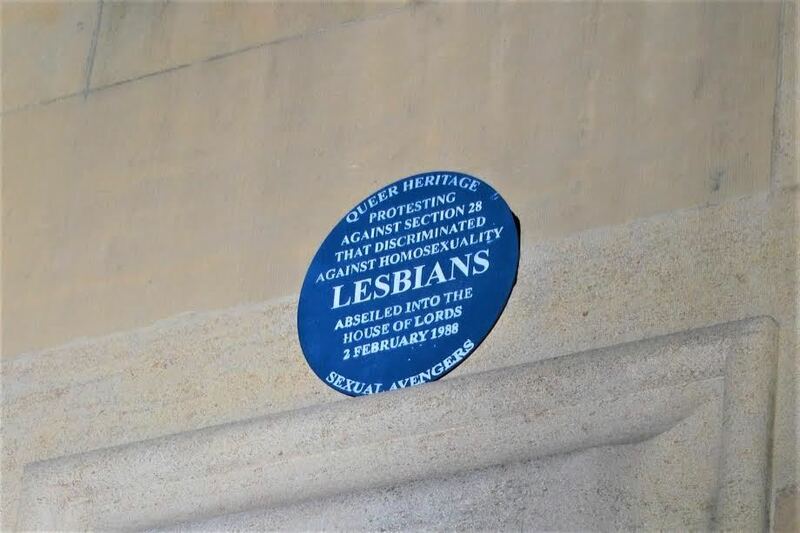 London’s blue plaques, however, won’t educate you on the four lesbians who abseiled into the House of Lords to protest “Section 28,” a law making it illegal for local authorities to “intentionally promote homosexuality or publish material with the intention of promoting homosexuality.” But after a local activist group called “The Sexual Avengers” tagged queer history locations around London last night, you could—just before security guards eventually took them down. The group, which includes members young and old, wanted to bring attention to the lack of publicly funded spaces for queer people. London has no public LGBTQI+ center of its own, no queer museum and no blue plaques to commemorate the radical, forceful ways queer people challenged authority to garner the rights we have today. OUT asked Tamsin Vibert, a member of the group, why this action was necessary in London: “We did it to queer up the streets, to mark our gay history and to protest that we do not have a queer museum or LGBTI+ center in this city,” they said. Some plaques the Sexual Avengers created were for the gay pub the “Admiral Duncan,” which was the location where three people died after a bombing from neo-Nazis in the ’90s, and another at the only location where there is an official Pride event for people of color. The Sexual Avengers meets weekly in London at the LimeWharf. Blue plaques might commemorate important sites across London, but they’re the reserve of the white, straight and male. We tagged along as activists ad-hacked important sites of LGBT history across central London to commemorate London’s queer culture. The Sexual Avengers assemble under cover of darkness at Piccadilly Circus, where the homosexual prostitutes known as “dilly boys” also once gathered. Not that you’d know it these days: the Soho site is all advertising hoardings and man-high LCD screens, with no sign that rent boys once hustled for clients along the boulevards of the tourist trap. That’s why this new direct action group want to reclaim the radical history of queer liberation, refusing a corporate-sponsored Pride culture where the Conservative government can claim credit for the progression and advancement of LGBTQ* rights, despite Theresa May having a seriously homophobic voting record in Parliament. “Many of us grew up with Section 28 in place,” Avenger Lucy Warin tells me as her comrades emerge from the night. She is referring to the Conservative legislation which banned material ‘promoting’ gay relationships from schools and council-funded projects. “Our rights were robbed from us – we don’t know the history of the struggles which brought an end to these tyrannical doctrines.” Section 28 was only repealed in 2003, and Prime Minister Theresa May voted to keep it. Laws like this only changed due to tireless campaigning and activism, and as we stand in the early morning darkness the Avengers make their mission clear: they want the LGBT community and others to remember those who paved the way for them, and to see there’s a long way to go before queer activism can become a thing of the past. In the midst of LGBT History Month, and this year marking half a century since the decriminalisation of homosexuality, the Avengers have assembled a flying squad of activists to sweep through London, making important locations for queer history with a traditional (and fake) English Heritage plaques, the blue signs which stud the homes of London’s great, good, and heterosexual. With the briefing over it’s time to hit up our first location. Just thirty years ago four lesbian activists abseiled into the House of Lords in Westminster to protest the latent homophobia of Section 28, but their brave intervention is unlikely to appear in GCSE textbooks any time soon. There’s barely any trace on the web. Despite a few dodgy looks from the cops and security, the first early morning action passes off without any major glitch. Next up we’re fanning out across the city, Lucy explains, as the team divides up targets, hitting locations like the Admiral Duncan gay pub where three people lost their lives to a neo-Nazi nail bomb in 1999, and the home of the UK’s only pride event for people of colour. “The mainstream narrative is about the gay bar, and that’s so important,” Lucy says, commenting on London’s queer scene today. “But the Royal Vauxhall Tavern wouldn’t have any customers without places like the 121 Centre, an amazing 5-storey queer squat with a community café, or the London Lesbian and Gay Centre, which was funded by a much more socialist London authority in the 80s.” The 121 Centre closed in 1999. You never notice how bright a London night is until you try to sneak through it undetected. Even now, in nominal darkness, it is all but impossible to move unnoticed by policemen or private security guards – or without passing floodlit luxury hotel developments. “Just what we need,” Avenger Dan Glass mutters disgustedly. The Avengers are keen emphasise their campaign is not just about history: “It’s an escalation of community, DIY action, of people taking queer history and bringing to life on the streets,” Dan says. It’s not hard to see why. One in four homeless youths identifies as LGBTQ*, and according to the Avengers one in three of London’s queer venues has closed in the last two years. Unlike Berlin, Los Angeles or New York, the city has no dedicated queer community space, while the UK’s main LGBTQ* domestic violence and mental health charities are both shutting down. The Avengers demand publicly-funded queer spaces, a queer museum and an end to rising queer homelessness. Their own weekly meetings serve as an “insurgent queer space”, connecting up queer campaigners battling for rights in fields from abortion to AIDs and allowing young activists to learn from octogenarian veterans. One of those four original lesbians from the House of Lords protest attended an Avengers meeting, she described buying washing line from a market and smuggling it into the galleries of the debate chamber wrapped round her waist, before rappelling down to join the peers. The plan nearly came unstuck when the rope dropped down around her ankles in the security queue. It’s these intergenerational connections the Avengers feel are so important, passing on the baton from one era to the next. To prevent a similar disaster though, the Sexual Avengers have come prepared. On the night before the action, they gathered in a gay pub to hand-paint the plaques and talk tactics. One 70-year-old activist known as Miqx tells me he’d been involved in the gay scene “since before it was legal,” turning 20 in 1967 when the age of consent for gay men was grudgingly lowered to 21. That excitement is mingled with apprehension. As the Avengers make their next approach, the gun-toting policemen outside Downing Street are a reminder that no matter how many Corporate Straight Ally awards the army collects and no matter how many cops go viral dancing at Pride, the UK’s security services remain homophobic and violent. But the strike goes off without a hitch. A diminutive Avenger called Ariana flies up the wall, slapping the plaque into place. Baffled security guards are left blinking dumbly at the plaque, yards out of their reach on the side of the building. The Sexual Avengers have made another mark. As the guards radio for orders the team moves on, pedalling furiously across the city to tag more targets. Outside the Admiral Duncan, runners are dispatched to collect a sound-system for a second action later in the same day, taking over the Greater London Authority’s Scoop amphitheatrefor a ‘queer show-and-tell’. The Sexual Avengers meet on Wednesday from 18.30 to 20.30 at Lime Wharf in East London. Find out how to get involved.